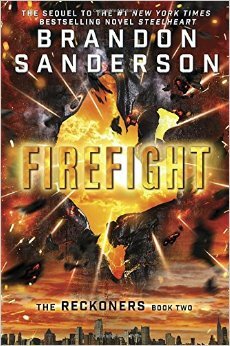 Firefight is the sequel to Steelheart. I’m not going to summarize it because I don’t want to give away series spoilers. A good series opening summary is available at that link. Note: There are major book spoilers after that summary. Back in 2013, Brandon Sanderson released two YA books, Steelheart and The Rithmatist. Prior to reading them. I’d devoured half a dozen of his adult books. Several of them had become all-time favorites, and Sanderson had earned his way into my top authors list. My kids had all read his children’s series (the Alcatraz books), but I hadn’t read them. I didn’t know how well Sanderson would transition from adult to younger audiences. In 2013, when I read those two YA books, my initial impressions were that 1) The Rithmatist was very young, more like middle grade fiction, without the meatier depths I preferred, and 2) Steelheart was much older, on the cusp of adult, and by far the superior book of the two. In the 18 months since, a strange thing happened. When I look back at those two books in my memory, while Steelheart stands out as the better quality book, it’s The Rithmatist that I really remember distinctly. Notably, this is most likely because Jason and I spent weeks reading The Rithmatist aloud to our boys, whereas I read Steelheart in two days. I’ve many times discovered that for me, reading a book fast leads to a distinct lack of longterm impression. Despite my mild disappointment, I have to note that Sanderson’s imagination and world-building is ever-brilliant. The bulk of Firefight takes place in the new version of NYC. (Steelheart was set in Chicago.) The city has been purposely flooded, so that the “roads” are now canals, like Venice. In addition, there is strange glowing spraypaint everywhere, and jungle-like plants that grow inside all the buildings that produce glowing fruit (and, sometimes, fortune cookies, which is frickin’ awesome). The city has been renamed Babilar, or New Babylon, and it’s this strange mash-up of Venice and the legendary Hanging Gardens of Babylon. Love! So it was a mixed experience, and it’s likely that if I’d read the book at a different time, I would have enjoyed it more than I did at this moment, when I’m craving thicker, meatier books. I’m definitely still planning to read the end of the trilogy when it releases next year, and look forward to seeing how Sanderson concludes this very fascinating dystopian world. This entry was posted in 2015, Prose, Young Adult and tagged dream-invader, place-character, speculative. Bookmark the permalink.